We took the keys out of the keyboard. Our hack uses Myo, a wearable motion-tracking and gesture-recognition platform, to allow the user to enter text into the computer only by waving an arm. You simply point to the key you wish to press, and rotate your forearm 30 degrees inwards to press the key. Because we send key press events to the CPU, this hack will work seamlessly with any program, much like a traditional keyboard. We were inspired when we first stopped by the Myo booth and realized the potential of the device. Originally having other plans, we rushed to the hardware booth to check one out and began discussing ideas. We had the realization that Myo could revolutionize text input and provide a way for people with disabilities preventing them from using traditional keyboards to still operate a computer with extremely simple hardware. The beauty of our hack is its simplicity. 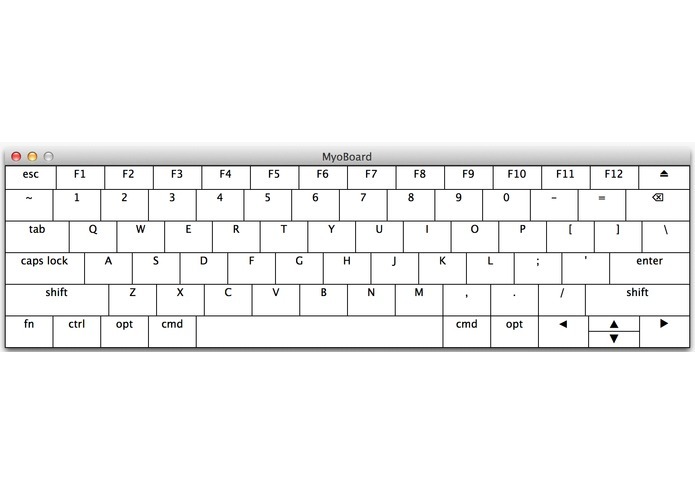 MyoBoard places a virtual keyboard onscreen that elegantly and plainly shows the selected key. You simply pivot your arm to press your desired key, a convenient and easy gesture that is highly intuitive. In order to delete a key or insert a space, just wave your hand left or right. And, if you need to use your arm for something other than typing, just touch your thumb to your pinky to deactivate the app.